I’ve had a lot of requests (including from my son) for some cars and trucks for the paper city. So here they are! There’s a template below if you want to try them out. Just cut on the black outlines and fold. Cool! My son is one happy little man! 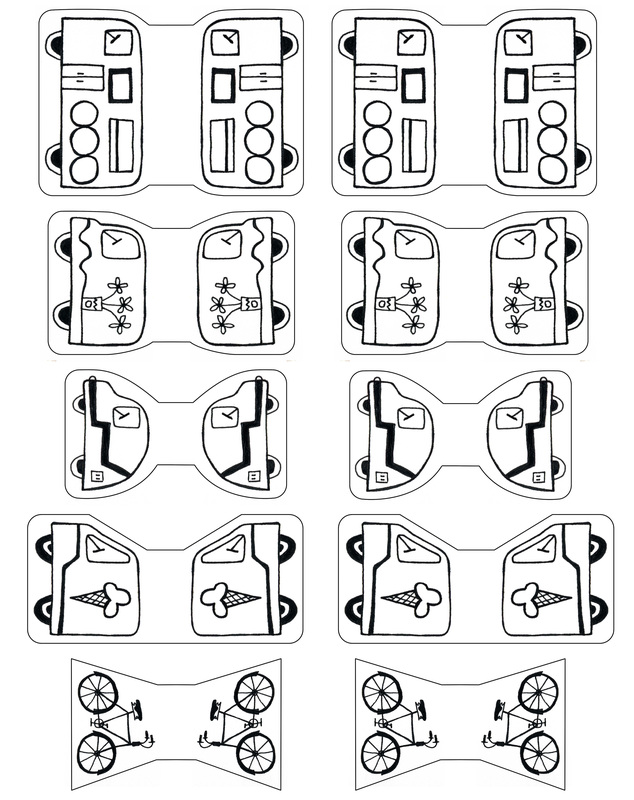 If you add a helicopter he will be over the moon:) We love all of your designs! I LOVE this city. Really! You are wonderful for sharing your talents with others. A BIG thank you! Great! We made our own paper city today and coloured it as well. See my blog! Peggy Rice - That's a good idea! I'll definitely have to make a helicopter. Effie - Thanks for showing me your paper city colorings. You have some great artists in your house! Today I arrived to your blog, itÂ´s amazing! I enjoyed with all of your proyects. I'm from Argentina, so my english may be pretty poor ... I'm sorry. Thank you! Our little town is still going strong. My little one will be thrilled to see the vehicles. What a cool blog! So glad I discovered it!! thanks for bikes and cars !!! I love this town !! My son will LOVE this. He's obsessed with cars. yeah!!!! bad weather here, 3 childs at home tomorrow... a great activity thanks to you!! @ Joel, thank you so much (blush). Thank you so much for sharing your lovely city design. It kept my 4 year old and I very occupied for most of the afternoon today. His older brother and father were also quite interested in it when they got home later in the day. Thank you for being so generous with your designs. I have just nominated you for a blogging award. Pop on over to see. Thank you so much for your design. 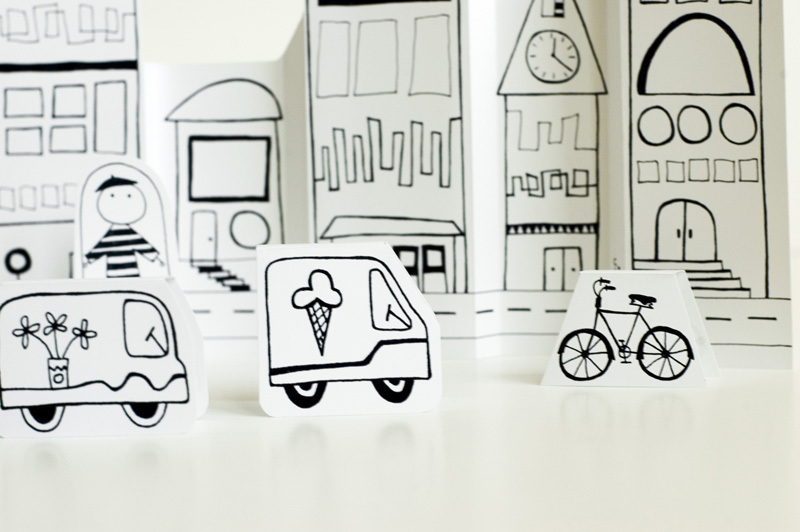 We have a bustling Paper City at our house thanks to your generosity. Thank you for sharing it. If so: parabÃ©ns e continuaÃ§Ã£o de um excelente trabalho! Thank you so much everybody. I love looking at all of your cities! Melro - Yes, my name is Portuguese, but it goes way back. I'd love to go to Portugal someday. would you accept to adopt me or mary me even if I'm old, already married and French ??? No ! mmmm, then I am going to continue to dream in front of the "merveilleux" world that you create and share here. Thank you so much; you've got a great talent! thanks for the idea and template my children have had loads of imaginative playtime using them. the photo paper was a great tip. Thank youâ€¦ we had a great time creating our own amazing red city, here in Israel! Both of my sons loved it! Cool, I love that trick too! 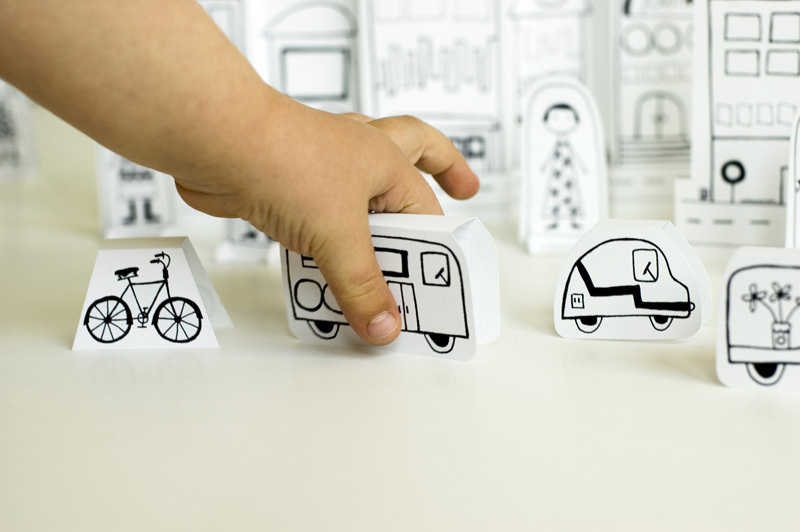 I've been doing this with another paper project that I'm working on, but haven't tried it with the paper city cars. Nice one! Wow, totally awesome! And I love that it's for a grown-up. Nice! Cindy - I've actually got something in the works that space and rocket people will hopefully really like! It's a project I've been working on for months! Hope to get it done soon. Hey Sara-Lee. Thanks! Hmmm, that's really weird that you're having trouble with pinning. Usually things pin just fine. 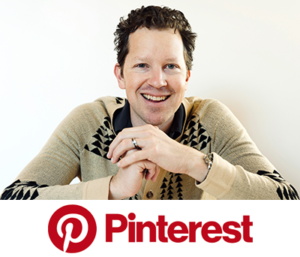 Yeah, I don't have a built-in pin button for my page, but you can pin photos from any site by using the Pinterest droplet thing. They have instructions for how to do it. Good luck and thanks again! Happy teaching! Hello Joel, somehow, I can't print the vehicule page right. When I click on the template, it doesn't open as a pdf but it opens in the browser. Am I the only one experimenting this problem? Wow, that was a quickly solved problem! Thanks! Oh, Joel, thank you so much for making these adorable images available. My 7-year-old will love them. Say, I think it's super that you offer them for free, but I was wondering, have you ever thought of putting ALL your coloring pages and paper city pages together into ONE PDF and then charging a nominal sum for it? It took me quite some time to click on and save as all the documents, and I know that *I* would certainly be willing to pay a buck or two to get them ALL AT ONCE, in one PDF. You could still offer them for free individually, but for those of us who want or need to maximize their brief online time each day, having ALL of them with just one click would be worth a dollar or two. Thanks for such a great site and such lovely resources! Thanks Morro! As for the one download. That's a good idea. I'll have to think about the best way to do that. 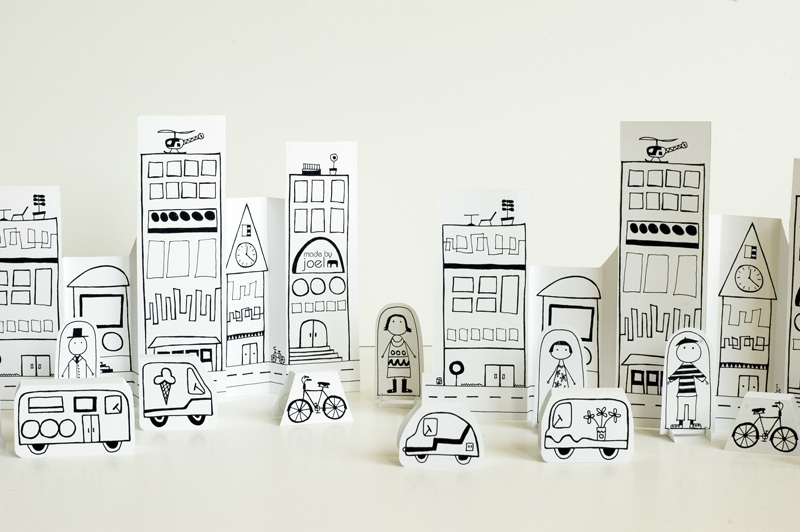 Also, I'm in the process of producing some of the paper cities as kits that people can buy. I'll keep everyone posted. Dear Joel, your paper city is amazing! I use it to play with my kids especially with our homemade moon sand. I've posted a link right here: http://faccioedisfo.blogspot.it/2012/12/il-mare-dinverno-ovvero-moon-sand-fai.html Thank you very much for sharing your talent! Wow, that looks so fun! Thanks for showing me! And very cool homemade moon sand! This is great! You should also do London! Great work!! Thanks! Yes, London is definitely on my to-do list! Just found your awesome website, thank you a lot for sharing your art! I'm a big fan ! Great ideas for teachers ! Thank you ! ... and what about having a railway station and a little train in your great little city?